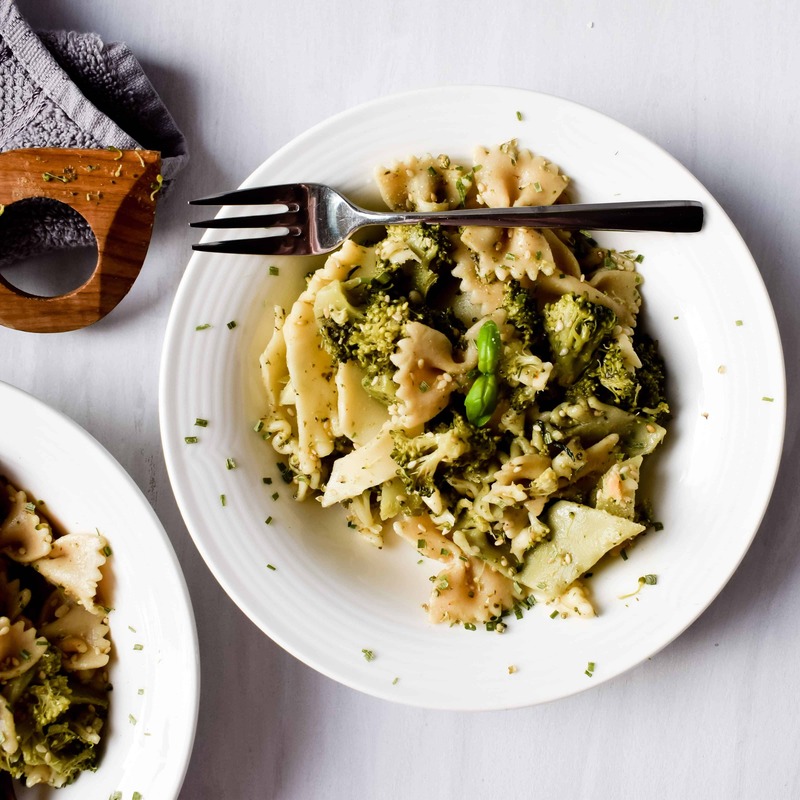 Vegan pesto pasta with broccoli is that one dish I’m always in the mood for. This easy-peasy vegan delight is my ultimate go-to pasta dish for when I don’t feel like putting super much effort into cooking, but don’t want to compromise on deliciousness. A comfort meal that’s easy, healthy and won’t break the bank – does it really get any better than that? Funnily enough, this is a recipe I partly stole from a friend and partly reworked (read: veganized). I first made it roughly 5 years ago whilst living my best student life in Brno, Czech Republic. Over 5 years and countless of new vegan recipes later, it still remains my favourite EVER pasta dish. Last but not least, this dish is a wonderful way to impress your dinner party guest! My girlfriend and I often have friends and family from Europe come over to stay with us in the UK and this is the one dish I always love to serve our guests. 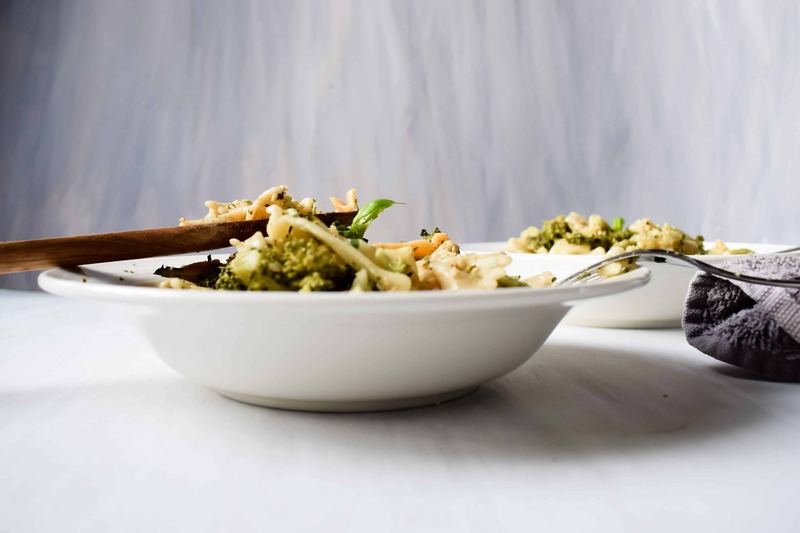 The vibrant green tones of broccoli and basil paired with golden shades of roasted nuts make this an Instagram-worthy meal that everyone will be raving about. P.S. – If you’re throwing a dinner party don’t forget to check out my vegan desserts. If you’ve never tried broccoli and pesto working to compliment each other in 1 dish, you have to promise me to give it a try. Feel free to make this vegan pesto pasta with broccoli in larger batches. Later on, you can eat the leftovers as a delicious pasta salad at work/school or a dreamy late-night comfort meal. 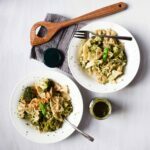 Store-bought green pesto is perfectly fine, but if you’re feeling particularly inspired, I would suggest making this, appropriately titled ‘best vegan pesto‘ by following Happy Kitchen Rocks’ 5-minute recipe. Roast pine nuts and sesame seeds (no oil) in a non-stick pan. Be careful not too burn them as that tends to happen very quickly! 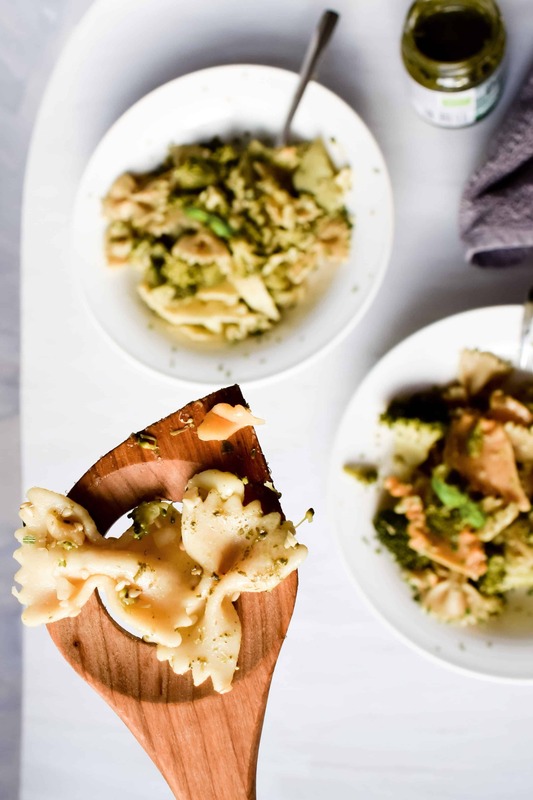 When your pasta is cooked, remove water and add broccoli, then stir through a couple of spoons of green pesto, seasoning and nuts. Add the vegan cheese of your choice and keep in mind that parmesan-like cheeses will work best! Sprinkle some chives and basil leaves on top. Stir through once again and it’s all done! Voila! HAPPY AND MINDFUL MUNCHING!